This almost rouses me to cast off my slugitude, but I don't want to rush things. In a comment to one of my posts, Jen sent me a link to an article about a West Virginia legislator (Democratic Delegate Jeff Eldridge) who wants to outlaw Barbies in the state because he says the doll's emphasis on beauty over intellect is bad for girls. Don't hate Barbie because she's beautiful! She's also smart. She knows how to change with the times. She's had every possible career: model, doctor, astronaut, soldier, veterinarian, nurse, political candidate, princess, secretary, athlete, singer, girlfriend, journalist, dog groomer, cheerleader, mermaid, naturalist. Why is it always toys perceived as "for girls" that everybody frets about, e.g., Barbies lower their self-esteem, or Easy-Bake Ovens or My First Sewing Machines trap girls in traditional gender roles? Why does no one say that boys are set up to fail in life by "for boys" toys because they can't live up to GI Joe's physical appearance, or they'll grow up to discover that they're unable to spin webs and leap from building to building and save the world like Spiderman, or even sometimes not have the right stuff to get a job driving a dump truck or racing a car or being a railroad engineer or a fireman? Why does conventional wisdom assume that boys are just having fun and know the difference between play and reality, whereas poor girls don't get that concept so end up huddled in a corner feeling inadequate and popping Valium because they aren't built to Barbie scale? THAT assumption, to me, is more demeaning than being given a pretty doll who is forever tiptoeing into her next adventure. And seriously, I doubt I ever knew a single female who asked for this hairstyle or made wearing this dress her life's ambition. 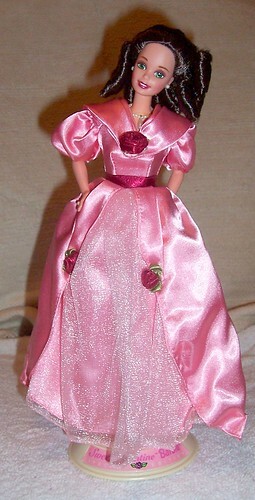 1995 Hallmark Sweet Valentine Barbie, gift of Lynne--one of the scrappiest women I know.